World-class high-density, fine-grain, wear-resistant alumina ceramic tile wear liners. CorroTile® is an extremely high performance abrasion and impact resisting ceramic lining system that features proprietary ceramic tiles molded in a matrix of premium, tear and wear resistant, energy absorbing rubber. CorroTile is the economical ceramic lining alternative for applications with sliding abrasion and moderate-to-heavy impact. The smooth tile surface reduces the tendency of materials to adhere to the chute wall, and the ceramic polishes overtime to a glass-smooth surface. Depending on the application, Corrosion Engineering application specialists can select from a variety of ceramic compositions to match the needs of the application. CorroTile is bonded to the steel backing plate using high quality, tear and abrasion resistant, energy absorbing rubber. The use of rubber, compared to other bonding materials, reduces possible fracture of the ceramic under impact. CorroTile is the most cost-effective solution to maximizing wear resistance in severely abrasive applications when particle sizes are approximately 2 inches (50mm) and smaller. This state-of-the-art liner is engineered with proprietary application-specific ceramics molded in a variety of Corrosion Engineering’s wear-resistant rubber compounds specifically designed for energy absorption and impact resistance. Corrosion Engineering will custom design and engineer CorroTile to perform optimally in your specific application. 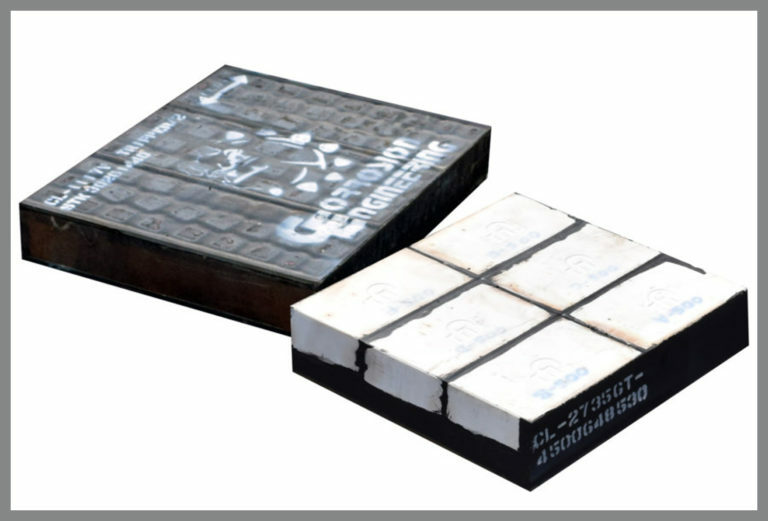 Corrosion Engineering’s premium grade ceramics have consistently outperformed most of the commonly used wear-resistant materials employed in material handling systems for dry substances, slurries and dust laden gases. Our high performance wear ceramics will outlast materials such as carbon steel, Ni-Hard, stainless steel, abrasion-resistant steel (AR) and others by a factor of 10 to 30 times. CorroTile has a very smooth ceramic tile surface that improves material flow and minimizes friction, and therefore prevents sticking and maximizes abrasion resistance. The ceramic tile composition and geometry is extremely effective for resistance against fine particles, severe impact and abrasion, and high pressure. Exclusive processes ensure a bonding of all liner components that exceeds the tensile strength of the rubber. This superior bond strength creates a liner that will remain intact with the inability for ceramics to dislodge from the rubber matrix, offering reliable wear protection through the complete life of the liner. With a compression strength in excess of 320,000 psi, these liners are extremely effective for high impact and sliding abrasion. With nearly 40 years of development, CorroTile is engineered with the optimum combination of structure, energy absorption, bond strength, and abrasion and impact resistance. Custom design features are incorporated in order to maximize your specific application’s performance. A steel backing plate gives the liner enhanced reinforcement and is customized with your attachment method of choice. CorroTile is ideal for relatively fine material applications with severe abrasion and high impact, including transfer points, deflectors, chutes, cones, crushers, cyclones, launders, feeders, tanks, skirtboards, and more. Corrosion Engineering designs and manufactures piping systems and components that dramatically increase service life. Superior bonding and proprietary rubber blends ensure ultimate reliability.